A distinctive and boldly themed gift basket for the Holiday Season. 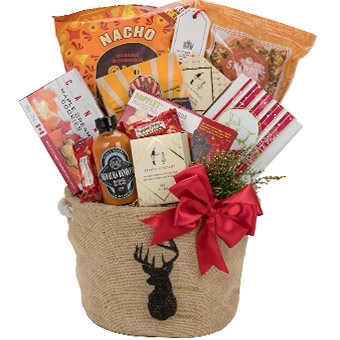 The Holiday Indulgence comes filled with: Que Pasa nacho chips, Revolver Sriracha hot sauce, Skippy's caramel kettle popcorn, maple cookies, mixed nuts, almond nougat, Island Nut Roasters trail mix, roasted salted almonds, assorted holiday chocolates by Haggensborg and a box of Holiday Amigos by Chocolate Signatures(white, milk and dark holiday themed chocolates). The Holiday Indulgence gift basket arrives beautifully decorated, wrapped in cellophane, topped with a matching hand tied satin bow, your gift card, gift tag, an elegant label and the optional personalized imprinted ribbon.